Jay and I finally decided to get rid of our wedding cake topper. It was taking up entirely too much room in the freezer. Room that could be filled with taquitos and fudgesicles, not a three-year-old cake. (I have needs, you know.) Of course, due to my own sentimental feelings, I refused to throw it out without having us eat some of it first. And by "some of it" I totally mean that I ate a tiny nubbin of frosting and proceeded to gag, as it pretty much tasted like I'd scraped some dusty ice off the sides of the freezer and put it in my mouth. Of course, Jay took an entire bite, chewed, swallowed, shrugged and walked away. I don't think I will ever understand him. In other random married-couple news, Jay and I are taking off on our road trip to Minnesota next week. Do you understand how excited I am about this? DO YOU? I'm borderline naseous with delight. (It's a good thing, trust me.) Jay and I are going to pick up some maps tomorrow to get a better idea of all the places we want to visit on our way there. It is going to be a lot of driving, but to us, that's half the fun. It is going to be amazing. I can't wait to see more of the country - I haven't had the opportunity to see very much of it yet. Well, as much of it as I'd like to, at least. So, this will be quite delightful. Also? I feel happy. Which is always a good thing. It really comes in waves, but right now I'm on one of those peaks where I feel like I can do anything, and that something incredibly delightful is waiting for me around the next corner. It's been a nice day. yay for road trips! is there a reason for minnesota? i mean, it's COLD there. ew. i've been trying to talk steve into a road trip too, he's all for it as long as it lands us in canada. (i seriously do not know what this kids fixation with canada is all about). Fun times. i hope you have a blast on your trip!!! i'm so happy you're happy, i'm working on that myself these days. ooh a road trip sounds like so much fun. I have always wanted to take a trip across the country. We kept cupcakes from our wedding cake since our top level of our cake was eaten. The cupcakes didn't make through the first year they started looking gross so I went back to the bakery and had them remake our top of our cake- best decision ever. it was yummy. i cannot wait until i am married. 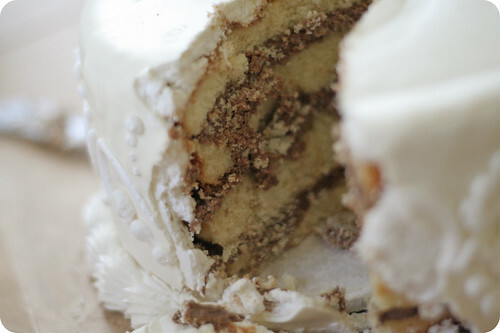 the cake thing is such a precious tradition, and i am a tradition kinda girl. but i hope you have fun in minnesota. i cannot wait until i have enough money to do a HUGE road trip. me and my best friend will one day. and i agree, driving is totally half the fun. people do not appreciate driving anymore. i am personally addicted to driving and love love love it. I missed something..... Why of all places are you going to Minnesota?? wow, three years in the freezer? i would be afraid taking a tiny bite would be a death sentance, but then again, i do have issues with expired food! haha. it is still a VERY pretty cake none the less! yay for road trips! i presume there will be plenty of pictures? I've heard that cakes after a year (or more, in your case) taste like cardboard. It's not something I really look forward to. Your cake story made me laugh out loud to the point of tears. Thank you for posting. On the road trip. I'm jealous. Scotte and I love to travel together by car. Last year we went to Colorado for Andrew and Tricia's wedding. Here's to a wonderful time, full of memories to last the next 50 years! Ooh! Have fun! And as for the wedding cake - we tried ours on our 1 year anni and it was quite yicky. I can only imagine what a 3 year stint in the freezer would do! have fun on the roadtrip!! what filling was your cake? because it still looked tasty, lol. i love road trips! i drove to arizona from wisconsin and back, it took 4 days to get there, 5 back, but it was gorgeous both ways. i took two different routes, one each way, which spiced it up even more. i got to see half the country that way! hope you have fun in minnesota! Have a great trip to Minnesota. That is where I live!!! What area will you be visiting? You should come back to Minnesota in the summer or fall, some day. Those are our 2 best seasons by far! We tried our cake on our year anniversary and it was horrible -- we bought felt sick after a few bites. WHY is that a tradition??? Yay for roadtrips! Have fun! Yay for road trips. I'm so jealous! Good luck on your trip! And congrat on being brave enough to even have a bite of that cake! you're coming to mn!? first of all, you know it's winter here, right? hopefully it warms up a little before you get there. what are you going to do and see?! have a great road trip. it sounds like fun. how long will you be gone? minnesota?! really?! why couldn't you have taken that trip BEFORE I MOVED?! ah, well. i think you will love it. the entire west side of this country is just beautiful and you get to drive all the way across it. i'm jealous. isn't the cake just nasty after that long? we hated ours too. Have fun on your vacation. love your blog. well this post brought big smiles. have fun on your roadtrip - you're right, the drive is half the fun. The cake looks yummy...but kind of like how ice creams looks yummy even if it's freezer burned, then you eat it and it's SO not! And hello, you take lots of vacations, I'm way jealous!!!!! Yay! Minnesota! I'm sorry that it probably won't be as nice as it is during late spring/summer/fall. I hope the weather is decent for your trip. I miss my home state a lot when I'm in Madison and I'm looking forward to moving back in a little over a year from now. Why are you heading to the Land of 10,000 lakes? Oh, how I miss Minnesota! You should stop in Austin (SE MN) and visit the SPAM Museum (yes, seriously). And the Mall of America in the Twin Cities. Winona and the bluff country is gorgeous, too. So jealous! Have a blast! Yay!!! Road Trip!!! What's the only thing more fun then a road trip?... Give up?....A roadtrip where the signs are in another language!!! Road trips are the best...I have been planning my own little adventure in France to celebrate my hubby coming home from deployment, and I am really excited about it too. I hope you have an excellant time. Bring us back a picture of a moose, ok? I hope you have a fantastic time on your trip. If you should happen to drive through Winnemucca you should totally stop, so we can meet up. I would love to meet you and your hubby. We have a fabulous mexican restaurant and pizzeria. I like the picture of you cake, sorry it wasn't any good. Your photog skills make it look delicious. I saw this and thought of you!!!! Your Jay sounds like my J, haha. Do you have family in Minnesota?? Great meeting you the other night! And we didn't save any of our wedding cake in the freezer. We just ordered a small version from the bakery on our anniversary. No freezerburn for us, thankyouverymuch. Oh my! I can only imagine! After a year in our freezer ours tasted pretty bad. The frosting wasn't so bad after a year though... but we had a raspberry filling that the rest of the cake absorb... Oh it was horrible! Glad you have more room in your freezer for yummy stuff! okay road trips are amazing, seriously amazing i say. have a great trip! YES! Road trips (if done with the right people) are incredible. More incredible than cake. You gave it a go! At least you tried. You will have a great time on holiday and road tripping it as well. Even better. Yay for being happy. Have fun on your trip! They say it's good luck to eat your wedding cake topper. I also love the idea of freezing a piece of wedding cake and eating it a yea later with your honey. Your pics and blog is amazing! What are you doing in Minnesota? I hope you have fun!